Can the Galaxy possibly conquer the iPhone 4? 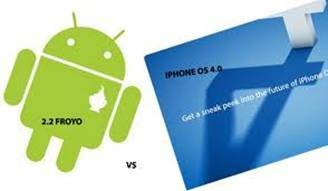 Not long after Apple Company released iPhone 4G, Samsung released the Samsung Galaxy S. But when the iPhone 4 hits retail shelves it will have to battle a gaggle of Android devices for consumer attention. 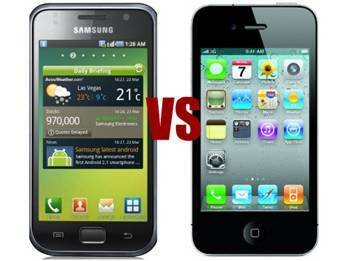 If you are considering upgrading to the latest version of the iPhone or getting an Android device, take a look at how Samsung Galaxy S Vibrant vs. Apple’s iPhone 4 to see which phone is the better value. The first thing you notice about the Galaxy S Vibrant is how it lives up to its name. The Super AMOLED touch screen which measures 4” and has a 480×800 resolution is truly stunning. It's massive and sharp and we'd say it's the best feature of the Samsung Galaxy S, and probably the best smart phone screen out there. The iPhone 4 uses an LED-backlit IPS-LCD screen at 3.5” with an astounding 640×960 resolution which they refer to as a “Retina Display” which is absolutely stunning too. Both phones have excellent screens, but the Galaxy S’s larger and brighter display makes for a better viewing experience. Samsung's Hummingbird Processor and Apple's iPhone 4's A4 processors are quite similar and were born from the same design. Both the Samsung Galaxy S and the iPhone 4 feature a 1GHz processor, but Galaxy S has a far superior graphics processing ability and will be much faster for gaming/graphics rendering. We've seen the capabilities of Apple's A4 processor on the iPad and it performs fantastically well. Samsung has a lot to compete with in this arena; although we're pretty sure Samsung will put up a strong fight and possibly prove victorious. The Samsung Galaxy S runs on Android 2.1, with Samsung's TouchWiz UI overlaid. It's a decent move from Android 1.6 offering Outlook support, more home screens and Flash Lite v3.1. Android also offers full multitasking unlike Apple which is always an advantage in our eyes, especially when you factor init speedy processor. The iPhone 4 runs on the newly innovated iOS 4. Features include interchangeable home screen wallpapers, multitasking, and a software audio controller that works with any background audio app, not just the iPod app. Apple’s iOS undoubtedly lacks the flexible open ecosystem of Android, which allows software like game console emulators that Apple has banned. However, Apple's App Store will be hard to beat, despite Android catching up on the apps race pretty quickly. Apple has made enormous strides in battery life in iPhone 4 comparing with its previous models like iPhone 3G and 3GS. We were able to get two days out of the iPhone before needing to charge, and that was with fairly liberal use of Wi-Fi, 3G and calling. The Galaxy S on the other hand was never able to go more than 24 hours on a full charge, and even then, I wasn’t able to use it as hard as the iPhone. However, with IOS4 you cannot have a spare battery, and will not being able to replace the battery on the iPhone 4. Both devices have 5 megapixel cameras capable of capturing 720p high-def video at 30 frames per second. The Samsung Galaxy S features a 5-megapixel camera mounted on the back and a Front VGA Cam. There's no flash or an anti-shake filter, or video calling as there is on the iPhone 4. The Samsung Galaxy S also features a secondary camera on the front for making video calls. Samsung's cameras traditionally produce stunning photos, so we can expect lots from the Galaxy S.
Along with the 5-megapixel camera on the back with LED flash, the iPhone 4 packs in a VGA camera on the front to allow for self-potraits and FaceTime calls. The more powerful camera on the rear even supports HD video recording, at a resolution of 720p at 30 frames per second. In video mode, you can trim the video clips you just shot and immediately upload them to YouTube via Wi-Fi. We see the flash as an advantage here because it means the iPhone 4 is prepared for any low-light situation. 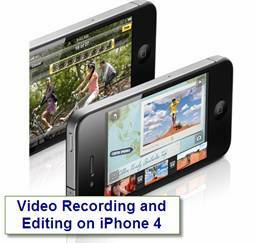 With its’ built-in powerful multimedia player, iPhone 4 supports iTunes compatible audio and video formats. Audio formats supported: AAC (8 to 320 Kbps), Protected AAC (from iTunes Store), HE-AAC, MP3 (8 to 320 Kbps), MP3 VBR, Audible (formats 2, 3, 4, Audible Enhanced Audio, AAX, and AAX+), Apple Lossless, AIFF, and WAV. Video formats supported: H.264 video up to 720p, 30 frames per second, Main Profile level 3.1 with AAC-LC audio up to 160 Kbps, 48kHz, stereo audio in .m4v, .mp4, and .mov file formats; MPEG-4 video, up to 2.5 Mbps, 640 by 480 pixels, 30 frames per second, Simple Profile with AAC-LC audio up to 160 Kbps per channel, 48kHz, stereo audio in .m4v, .mp4, and .mov file formats; Motion JPEG (M-JPEG) up to 35 Mbps, 1280 by 720 pixels, 30 frames per second, audio in ulaw, PCM stereo audio in .avi file format. As to Samsung Galaxy S, the smart phone features music player with SoundAlice, supporting audio file types including MP3, AAC, AAC+, eAAC+, OGG, WMV, AMR-NB, AMR-WB, WAV, MID, AC3, IMY, FLAC and XMF. The HD Video Player & Recorder in Samsung Galaxy S is able to play videos up to 1280 x 720 at 30fps. 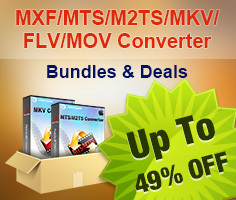 Supported video formats are 3GP, MP4, AVI, MKV, FLV encoded in DivX, XviD, MPEG4, H.263, H.264, WMV, and VC-1 codec. Both iPhone 4 and Samsung Galaxy S supports limited video and audio formats, relatively the latter is compatible with a wider range of codec and formats, including flash and MKV formats. Luckily there is software to make up. With an ultimate video conversion tool named Pavtube Blu-Ray Video Converter Ultimate (its Mac version called iMedia Converter for Mac), you’ll be able to turn blu-ray disc, DVD, MKV, AVI, MOV, MP4, WMV, M4V, VOB, TS, MTS, M2TS, DivX, H.264, H.263, VC-1 videos into optimized video and audio for iPhone 4 and Samsung Galaxy S using its preset profiles. The converter covers all the compatible video formats with iPhone 4 and Samsung Galaxy S, and output videos ranging from 320*240, 640*480, 800*480, to 1280*720/30fps. 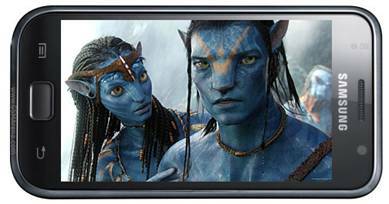 Learn How to convert Blu-rays, DVDs, and different videos to Samsung Galaxy S phones, including Samsung Vibrant, Captivate, Epic 4G, and Fascinate. 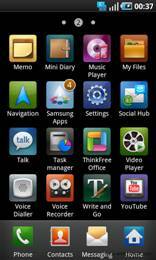 The Galaxy S Vibrant and the iPhone 4 are both incredibly sophisticated and powerful smart phones that are ideal companions for people who want complete control of their digital lives while on the go. Which one you choose will likely boil down to user’s preference. If you are a Mac fan and already hooked into the Apple ecosystem because you own devices like the iPad or iPod Touch, the iPhone 4 will allow you to maximize your existing investments. If you are swayed by fashion and trends, get the iPhone 4. You’ll get tons of admiring glances and you’ll have a virtually unlimited choice when it comes to accessories for dressing up your phone. If you are an average user that need an iphone works out the box, iPhone 4 is your choice. If you are frustrated by the inaccuracy of touch screen keyboards, Samsung’s embedded Swype application largely takes the pain out of this experience and 2 minutes of playing with it will make anyone feel speedy. If you prefer to exert more control over your technology instead of going with the default settings, the combination of Samsung’s TouchWiz 3.0 interface and the Android 2.1 OS gives you lots of choice in how you interact with the Galaxy S.